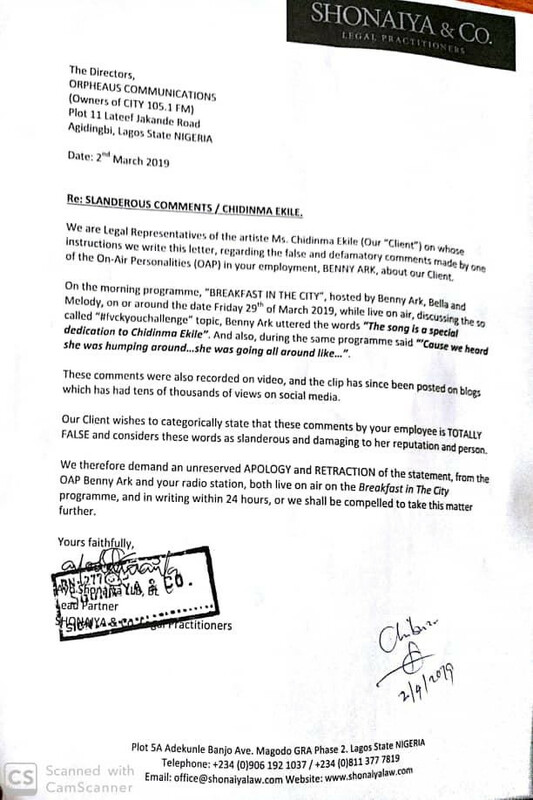 Nigerian singer, Chidinma through her lawyers 'Shonaiya & Co' have written a letter to City FM in Lagos demanding a public apology and retraction of 'defamatory' statements by its on-air personalities who said the viral Kizz Daniel 'Fvck You' song was about Chidinma and that the singer humps around. 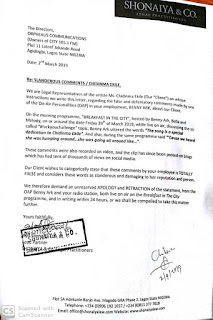 In a chat with LIB, Chidinma'a legal representative Ayo Shonaiya said, 'this is just a Notice to the station and the OAP to retract his comments and apologise to Chidinma because those statements are false and defamatory'. He added that, 'It is their next move or how they respond that will decide our next move'. Chidinma and Kizz Daniel were rumoured to be lovers before their relationship hit the rocks at some point in 2018.